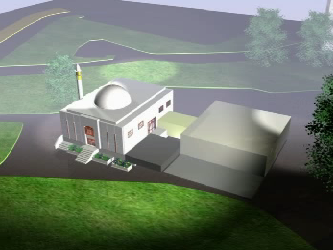 The current situation of the project originated from the pressing need of the Muslims for a Mosque and a school. The volunteers of AMA Canada have prepared in collaboration with the management and various specialized offices, a complete and detailed plan to establish the project. The plan detailed development phases as well as all associated costs per phase. 1. Large Mosque that could accommodate around 2000 worshipers. c. A Basement with washrooms, a library and. an office for the Imam. 2. School (Intermediate and Secondary) that can accommodate 12 classrooms/gender. School is equipped with a lecture hall as well as a gymnasium complete with associated services. 4. The school can accommodate about 500 students (boys and girls). Constructing a Mosque which will accommodate around 2000 worshipers. It will consist of a main floor and a half a floor for ladies. The basement will have a library and an office for the Imam as well as washrooms. Consists of constructing a school for the levels of intermediate and secondary. It will have twelve classes for each gender (separately). The school will have a lecture hall as well as a gymnasium equipped with all associated services, a library and offices for the volunteers. The school will have about 500 students (boys and girls). This stage will also include constructing a house for the Imam and the Mua�dhin in addition to the green space and gardens around the Mosque, and space for play ground for children. The land is located in a visible region of the south of the Ottawa city, and it is considered one of the fastest expanding and developing regions in the city. One could say that the south region is the largest Muslim neighborhood of the city. The land of the project is about 20,000 square meter. The main entrance of the project faces a major road called �Hunt Club Road�, which is about 200 meters from the most important street in the city called �Bank Street�, which connects the North of the city to the South. The purchase of the land is accomplished with the donation a pious person. And Alhamdu Lillah all the general design stages of the land is completed. In addition to that, obtaining of the building permit is from the city is done. � The committee from AMA responsible for operations. Members of board of trustees have been appointed together with other volunteers with proper Islamic knowledge and technical experience to oversee the general development of the project. An engineering consulting firm (NOVATECH) was contracted to obtain offers to supervise the project. This company will be responsible for the complete supervision of all aspects of the project, the construction responsibility, Electrical, or Mechanical. This supervision is based on detailed specifications that were put together ahead of time. The engineering consulting firm is responsible for the quality of the specifications according to the Canadian laws. To ensure the quality of implementation, an attorney was hired to review all contracts with various companies.